A scene from the 2017 concert at Hendricks Chapel. Hendricks Chapel invites the Central New York community to celebrate the sounds of the season at the annual Holidays at Hendricks concert on Sunday, Dec. 2, at 7:30 p.m. at the chapel. The event is free and open to the public. Doors to Hendricks Chapel will open at 6:30 p.m. All are encouraged to arrive early, as seating capacity is limited. Donations of non-perishable food items for the Hendricks Chapel Food Pantry are encouraged. A reception with light refreshments will follow the concert in the Heroy Geology Laboratory lobby. Public parking is free and available on a first-come, first-served basis in Irving Garage, the Hillside lot and all open Syracuse University parking lots. Those who require accessible parking or would like more information about the event may call the chapel at 315.443.2901 or email chapel@syr.edu. 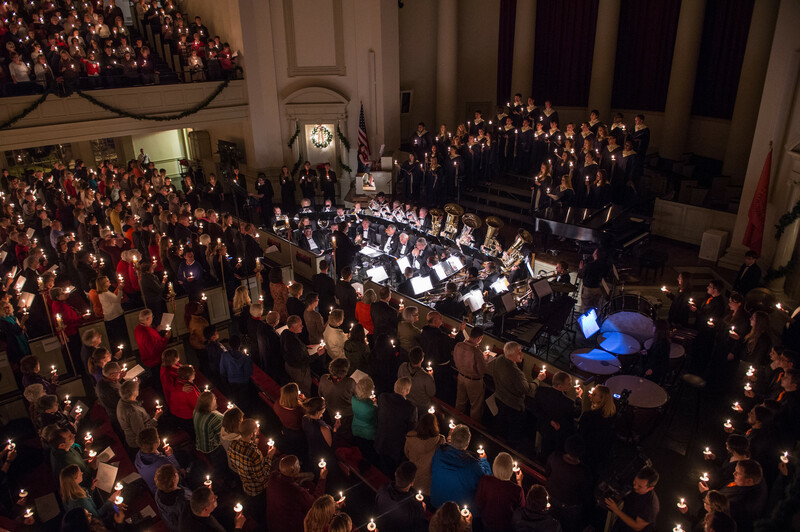 Holidays at Hendricks is a concert with a long tradition at the University. Performances will be given by the Hendricks Chapel Choir (José “Peppie” Calvar, director); University Organist Anne Laver; the Syracuse University Brass Ensemble (James T. Spencer, director), the University Singers (John Warren, director), Crouse Chorale (Hillary Ridgley, director), the Syracuse University Concert Choir (Peppie Calvar, director) and the Syracuse University Vocal Jazz Ensembles (Jeff Welcher, director). The Chimemasters from the Setnor School of Music will ring the Crouse College chimes before and after the show. This year’s program will also include a surprise guest conductor. Thanks to a partnership with WCNY, the performance will be broadcast in late December on public television and radio stations throughout Western, Central and Northern New York. Dates for the broadcasts will be announced soon. Hendricks Chapel will also post regular updates about the event through its Facebook, Twitter and Instagram pages.